Located in Ashland, Mountain Meadows is a 55+ Community on 27+ acres of lush landscaping, with beautiful homes and condominiums and is alive with residents just like Dad. Voted America’s Best Small Active Retirement Community by the National Council on Senior’s Housing (1999), Mountain Meadows offers the opportunity to own property and build equity in your investment. The residents own and govern here – no big, impersonal corporations. There is a 3-story clubhouse, fitness center with indoor pool, raised garden beds in the Kitchen Creek Garden, 4-acre park, incredible wood shop and much more. There are interest groups, committees, special events, musical concerts, fitness classes and excellent food in the private dining room. Isn’t it time that your dad was living closer to you? Isn’t it time he had the best? Isn’t it time to give back to Dad some of what he gave to you all these years? Isn’t it time your children learned some of the special things about Grandpa? YES — it is time. Don’t wait – consider the “best” for your Dad. 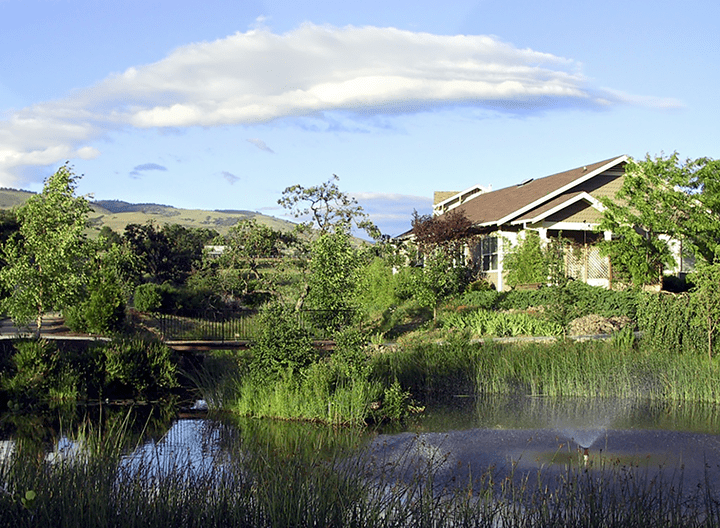 Consider Mountain Meadows 55+ Community today. You grew up with the best your dad could offer. Now what you imagine can become a reality for your dad right here in Ashland, Oregon.